PeachDish vs. Blue Apron: Which Meal Kit Is Right For You? Could you use a little help deciding between PeachDish and Blue Apron? We’re here to help! To make your decision a little easier, we’re reviewing the available meal options, portion sizes, delivery details, and everything else you need to know! One of the biggest benefits of going with a meal delivery service is the fact that they offer different meal options—ones you might not find at your local grocery store. If you need a little variety in your life when it comes to the meals you eat, PeachDish has plenty of options to consider. They don’t have any designated meal plans, like some other services do. However, they do have a full menu that contains plenty of options for you to choose from. You can also sort the menu based on meat dishes, seafood, vegetarian, vegan, and no gluten added. They also have “Quick Fix” meals for those who want something that’s fast and easy. Each week, you’ll be presented with 19 different dishes to choose from. It’s a pretty impressive selection that includes dishes such as: Paprika-Roasted Fish with Spring Onion & Potato Salad, Herbed Goat Cheese Linguine with Sliced Chicken Breast & Asparagus, and Grass-Fed Beef Noodle Soup with Spinach & Spring Peas. You can even find some dessert options like Strawberry & Poppy Seed Cupcakes with Lemon-Mascarpone Frosting. Blue Apron’s meal selection isn’t quite as extensive as what PeachDish has to offer. However, that doesn’t mean they don’t have equally as impressive meals. Each week, you’ll be presented with eight different recipes to choose from and it still gives you a great deal of variety. You’ll find dishes like: Mexican Beef & Rice Casserole with Tortilla Strips, Spicy Fusilli Pasta & Broccoli with Mascarpone, Apple & Cheddar Grilled Cheese with Carrot & Pickled Pepper Salad, and Sheet Pan Fried Chicken with Spicy Collards & Roasted Red Potatoes. Do you have a big family to feed or only cooking for one? Portion size and the ability to control it when you’re ordering is an important factor to consider when choosing the right meal delivery service. For those who have a family to feed each night, you’ll want to pay close attention to the serving count when ordering PeachDish’s meals. They have options for two servings, four servings, six servings, eight servings, and even 12 servings. That means you’re able to find something that best suits your needs. This is something most meal delivery services don’t offer, so this could really come in handy for you. When it comes to serving sizes, Blue Apron can’t compete with PeachDish’s offerings. However, if you only need two or four servings per meal, it will absolutely get the job done. Each week, you’ll have eight two-person recipes on the menu. And there will be four recipes that are suitable for four people. So, you are limited on your choices if you need additional servings for your meals. Both PeachDish & Blue Apron will provide you with fresh, pre-portioned ingredients to cook your meals. They’ll send you all the essential items of your dish, which means you don’t have to bother with doing the grocery shopping. You will, however, need to have the basics on hand in case your recipe calls for them. That includes things like olive oil, salt, and pepper. Before placing your order, you’ll be able to see all the ingredients you’re getting in your order. This way, you know exactly what you’ll be working with ahead of time. And this can really come in handy if there are any specific ingredients you’re trying to avoid in your diet. No matter who you choose to purchase your meals from, you’ll be provided with detailed recipe cards to guide you in cooking your meal. 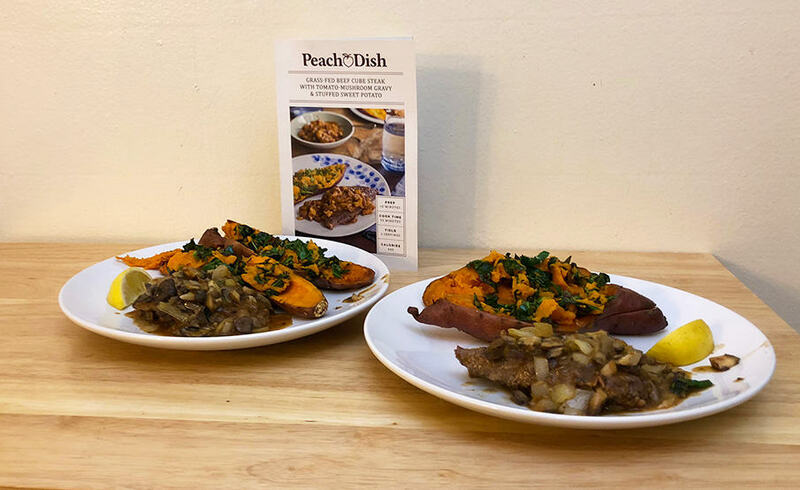 Even beginners can handle cooking with PeachDish and Blue Apron because they’ve made it easy to do so! With pictures and step-by-step instructions, you can confidently prepare a meal with ease. While both companies share the ingredients list for each of their meals on their site, PeachDish doesn’t allow you to see the recipe instructions ahead of time. This could be a deal breaker for someone who wants to know what a dish involves before ordering it. Blue Apron, however, shares the detailed instructions right there on the meal page. They have all the steps you need to know, as well as photos. You can easily see how many steps a meal requires before you commit to it. It could be the deciding factor in which dinners you add to your weekly menu. When it comes to meal kits, there can be no issues with delivery. One delay can mean spoiled food. Taking delivery and shipping into consideration with your final choice is very important. With PeachDish, they ship everywhere in the United States except Alaska, Hawaii, and Puerto Rico. When placing your order, you’ll be prompted to choose your delivery date based on what’s available for your zip code. Then, you can expect your order to arrive between 11 AM and 5 PM on that day. They’ll also charge different fees depending on whether or not you’re a PeachDish subscriber or a guest customer. For most states, they’re able to get free shipping on all of their orders. However, the following states will incur a $15 shipping charge: Arizona, California, Colorado, Iowa, Idaho, Kansas, Maine, Minnesota, Montana, North Dakota, New Hampshire, New Mexico, Nevada, Oklahoma, Oregon, South Dakota, Utah, Washington, and Wyoming. If you’re a guest, you will pay a $12 guest fee per shipment with PeachDish. And if you’re in one of the aforementioned states, you’ll also have to pay the additional $15 state fee. So, if you’re considering ordering from PeachDish, being a subscribe will help you save some cash. 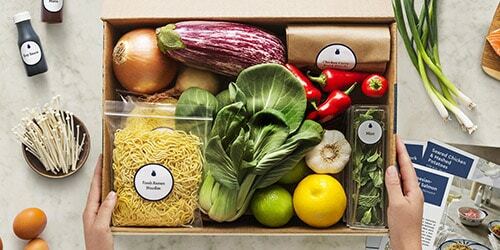 Blue Apron only delivers meals to the contiguous United States. When you sign up and place your first order, you will have the option to select a delivery date based on what’s available in your area. This will ensure you always know what day your meals are coming each week and you can plan around that. And your weekly meals will ship for free. Packaging is extremely important when it comes to meal kits. This is for two reasons. First, you want your meals to be packed in a way that keeps them fresh and cold in transit. Second, you want the packaging to be as environmentally friendly as possible. PeachDish is big about encouraging their customers to reuse or recycle the packaging that’s included in their order. To keep your food cold during transportation, they rely on ice packs so everything stays at the optimal temperature. These can be reused or you can drain the non-toxic gel in the trash and recycle the plastic liner. They also use organza bags for storing things and they share all kinds of creative ways to reuse these. Their plastic jars can be reused or recycled because they’re a #6 plastic. Protein pouches can easily be reused for a road trip to keep food cold, the jute liners are compostable, and their plastic bottles can be reused or recycled. And don’t forget, you can put your cardboard box out for curbside recycling. To ensure your food stays fresh during transportation, Blue Apron packs their boxes with insulated thermal liners and refrigerants to keep everything at the optimal temperatures. They will alter the size or quantity of the refrigerants or thermal liners based on the season, weather condition, box contents, and delivery destination. You don’t need to worry about anything spoiling. To recycle the packaging, there’s actually a Recycling page in your Blue Apron account that you can refer to. This provides you with detailed instructions on recycling each item at home, plus it gives you a tool to find local places to recycle the packaging. Ordering anything online poses a small risk. Are you really going to get what you ordered? What happens if it gets damaged while being shipped? Having a money back guarantee or satisfaction guarantee goes a long way in the meal delivery kit industry. To ensure customers are happy with their meal delivery service, PeachDish offers a 100% satisfaction guarantee. If you aren’t satisfied with your meal, get in touch with them and they’ll make it right for you. Depending on the situation, they may offer a refund or credit to your account. There’s also a “Freshness Guarantee” for customers of Blue Apron. If any ingredient in your order is missing or not in an acceptable cooking condition, you need to let them know within seven days of receiving your order. They’ll make the situation right to ensure you’re happy with the delivery. Good customer service is important when it comes to meal kits. There are often questions that need to be answered and having someone there to help when you need them can make or break your meal kit experience. There are a number of ways you can get in contact with PeachDish if you have a question or an issue with your order. They provide their phone number, email address, and a live chat. You can expect a response from their team during their business hours, which is Monday through Friday at 9 AM to 5 PM Eastern. If you need to reach Blue Apron for any reason, there is a contact page on their website. This provides you with a form you can fill out, but they also give you access to specific email addresses for your concerns. Alternatively, you can give them a call on the phone to get your issue resolved. The only thing they do not offer at this time is a live chat, which is something PeachDish does have. Both PeachDish and Blue Apron offer referral programs for their customers. With PeachDish, you can refer friends and family by giving them $10 off their first box. Once they’ve signed up, you’ll receive a $10 credit toward your next meal. 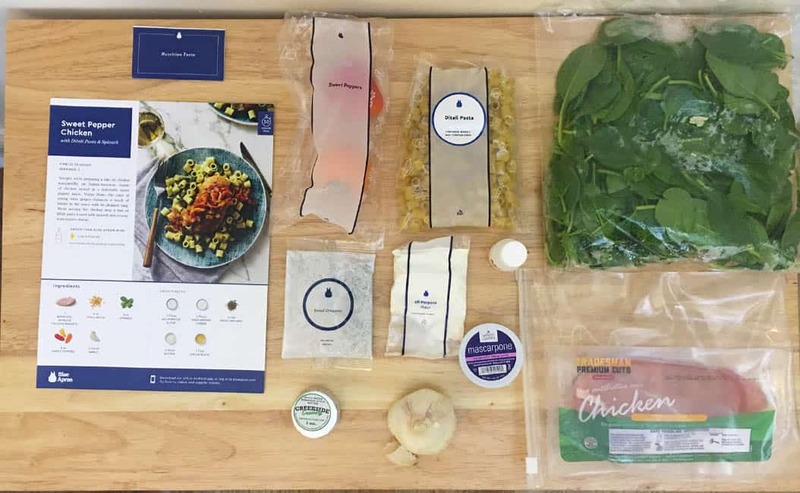 Blue Apron has an affiliate program you can sign up for, which will get you a $15 credit for each new subscription you drive to their service. Another benefit for Blue Apron customers is that you’ll also get access to their wine selection. They’ve made it easy for customers to expertly pair wines with their meals. 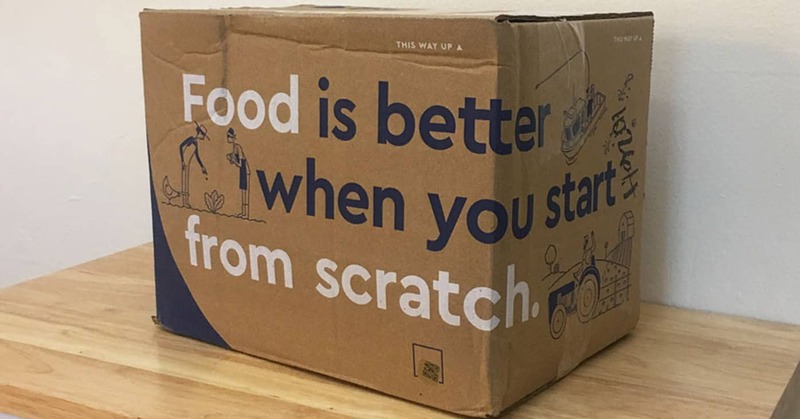 So, if that’s something you’re interested in, it just might give you the extra push to go with Blue Apron. PeachDish will give you beer and wine pairings on their site, but you aren’t able to purchase through them. PeachDish and Blue Apron are two of the biggest meal kit companies out there. And while they may seem similar in what they offer there are subtle difference in each. While it was a hard choice, I would go with Blue Apron over PeachDish. While comparing both companies I realized how similar they are. However, after reading both comprehensive reviews and rewatching our initial video reviews, I was reminded of how delicious all of our Blue Apron meals came out. Plus, they were much more simple to prepare than PeachDish. 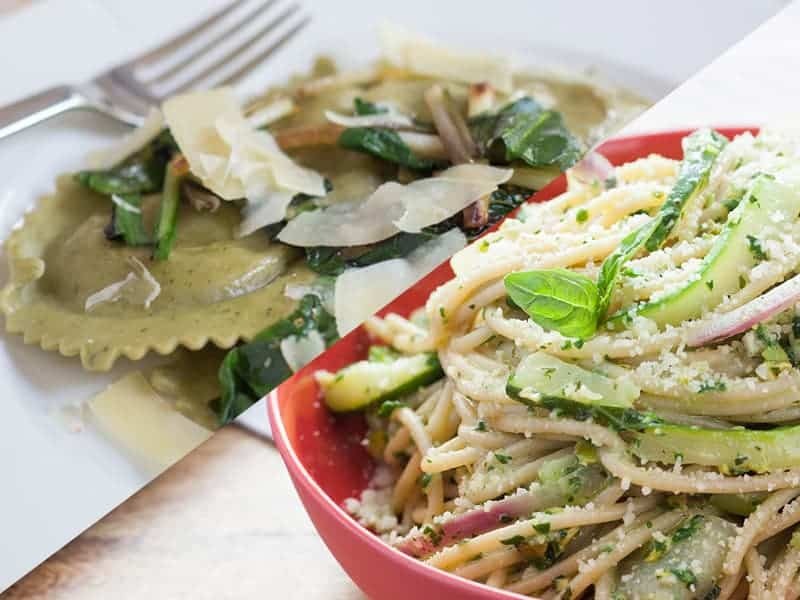 Regardless of which meal kit you choose, they’re both going to provide you with great meal experiences. Have a question about either? Leave a comment below and I’ll answer it ASAP! As someone who is considered an "average" cook, I have looked far and wide for meal delivery services that will help save me time and money while still ending up with a tasty meal. In my quest, I have tested and reviewed tons of different food delivery services. I am using this site to share all of my findings with you! Shipt vs Instacart: Which Of These Grocery Delivery Services Is Worth It? Hello Fresh vs Blue Apron: Which Of The Two Biggest Meal Kits Is Right For You? Sun Basket Review: Is This Healthy & Organic Meal Delivery Service Tasty Too? Green Chef Review: The Best Healthy Meal Delivery Service Ever? Daily Harvest Review: What Makes This Smoothie Delivery Subscription Worth Purchasing?